Capital Real Estate is one of the premier real estate agencies in Hungary. For its own benefit, and that of its clients, Capital Real Estate seizes the extraordinary opportunities which exist in owning real estate in the newly ascended Central European countries, specifically in the capital cities such as Budapest . Such a strategy employed in the burgeoning Budapest real estate market (Hungary joined the EU in May, 2004), has produced historically per annum returns on investment in excess of 20% or more taking into account rental income and modest renovations. Find research material and useful tips on how to invest in Budapest. Information on taxes, descriptions of districts, legal procedures, frequently asked questions as well as 7 Steps of Purchasing Property. Access Capital Real Estate Budapest's Investor Cente. Call us on +36 (1) 219 5505 during business hours or use the request information page to get in touch with Capital Real Estate. Hungary was the first Country in Central Europe to join the World Bank and IMF in 1982. 70% of the total FDI (foreign direct investment) injected into Hungary is allocated to Budapest. Over 30 Billion euros have been injected since 1989, and the growth rate of FDI in 2003 reached 45%. Hungary was the first Country in Central Europe to join NATO in 1999. Hungary became a full member of the European Union on May 1st 2004. Hungary gets nearly one third of all foreign direct investment flowing into Central Europe, with cumulative foreign direct investment totaling more than US$185 Billion since 1989. €22.6 Billion of EU funding currently being invested in the country. 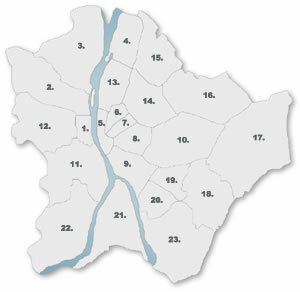 Budapest is a popular location for large multinational companies, over 45 of the 50 blue-chip multinationals are located here. To receive monthly email updates with the latest news and up-to-date information from CRE enter your email address.